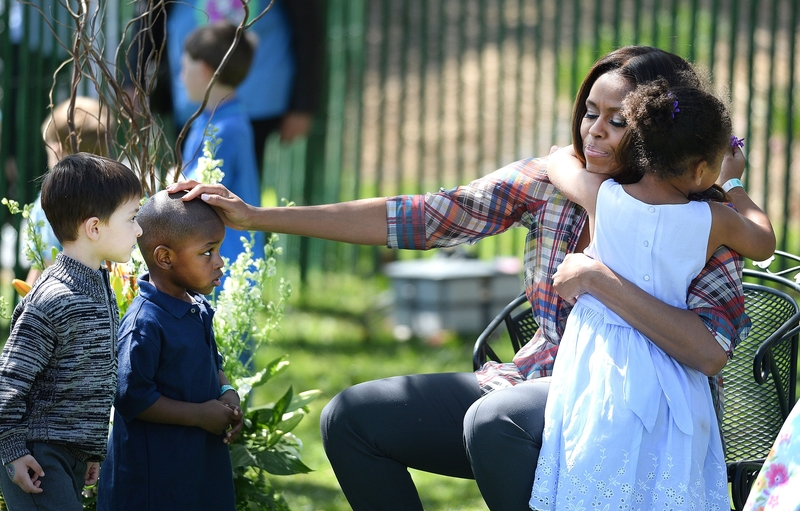 First lady Michelle Obama greets kids after reading them a story during the annual White House Easter Egg Roll. WASHINGTON – Instead of chocolate and candy baskets, the hordes of children gathered Monday on the South Lawn for the White House’s Easter Egg Roll got an Eggtivity Zone and a Yoga Garden. To mark the 136th annual Easter event, first lady Michelle Obama threw in some exercise stations and healthy eating tips along with the traditional fun and games, which included egg-rolling races and storytelling. “We want our kids to be the healthiest and the strongest they can be, so they can do well in school and live up to all of their God-given potential,” she said. Donning flowery dresses, petticoats and sweater vests, toddlers and children visiting from all 50 states and the District of Columbia were largely oblivious to the celebrities around them. Among those in attendance were actor Jim Carrey, celebrity doctor Mehmet Oz and Miss America, Nina Davuluri. One group of egg-rolling contestants was joined on the lawn by the president and his wife, who cheered the participants on from the sidelines. The White House expected more than 30,000 visitors during the daylong festivities, which it has hosted since the 1870s. Obama read Maurice Sendak’s children’s book, “Where the Wild Things Are.” With a group of children arrayed before him, Obama mimicked the book’s monsters, gnashing his teeth and growling and challenging the youngsters to a staring contest. Prior to Monday’s celebration, the animal rights group People for the Ethical Treatment of Animals released a video of three young girls demanding that the first lady end the traditional distribution of colored hard-boiled eggs. This year, the leftover eggs will be distributed as souvenirs.